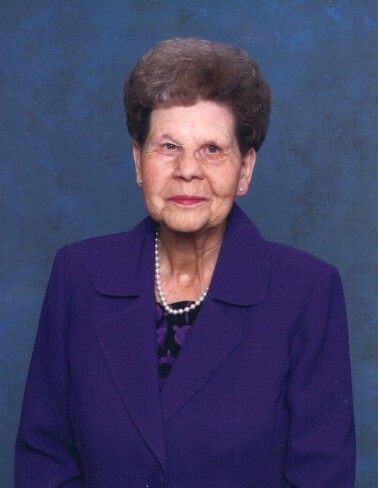 Angie went home to be with the Lord on August 31, 2018 at the Lacombe Hospital and Care Center. Angie was born at Gravelbourg, Saskatchewan on March 30, 1931, the oldest child of Earl and Delia Smith. The family moved to the Ponoka area in 1934 where Angie resided until she married Emil Rauhala in October 1949. After many moves around Central Alberta the couple moved to Red Deer in 1967 were they stayed until Angie moved to Lacombe in 2003 where she lived until her passing. Angie was predeceased by Emil along with a grandson Corey, her parents, and many siblings. Angie is survived, and will be greatly missed, by her children: Wayne and Lorraine, Art and Noryne, and Barb and Gerry. Along with her grandchildren: Shauna and Jay, Laura and Ren, Traci and Geoff, Carrie and Barry, Darci, Ryan and Zom, and Aaron and Kim. Angie will also leave behind her 12 great grandchildren and 2 great great grandchildren. Angie is also survived by her sister Earlene and brother Bob and Donna and numerous nieces, nephews, and close friends. Angie was a very quiet, kind, compassionate person who will be missed greatly. Angie loved flowers and puttering around in her yard. She was also a wonderful cook and made the best mashed potatoes, just ask any of her grand-kids. A Funeral Service will be held on Friday September 07, 2018 at the Clive Baptist Church at 1:00pm. Donations may be made to the Lending Cupboard, 7803 50 Ave #1, Red Deer, AB T4P 1M8 -or- Alzheimer Society of Alberta & Northwest Territories, 14925 111 Ave NW, Edmonton, AB T5M 2P6.